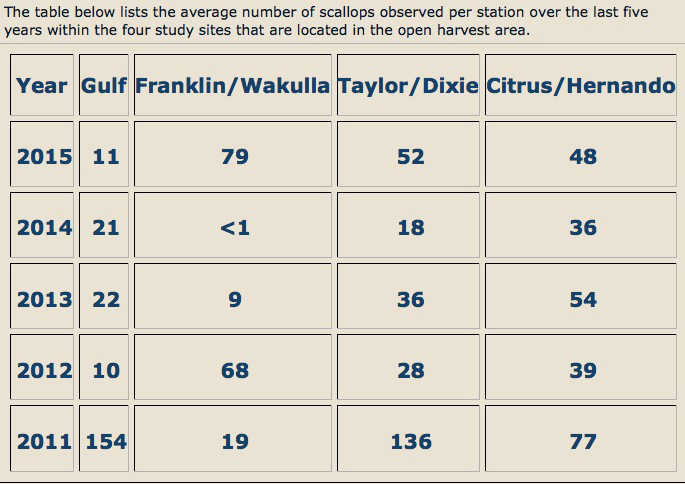 The “Bay Scallop Abundance Survey” results from Florida’s Fish and Wildlife Conservation Commission (FWC) is always wildly-anticipated by folks hoping to catch their limit of these tasty bivalves during the summer harvest. The 2015 season begins on June 27 and ends on September 25. There’s plenty of information about the “how-to” of gathering your own scallops (see: http://www.saltwateranglersguide.com/?page_id=2215, for example) but everyone wants to know if the current year’s “crop” is good. The FWC has just released the 2015 numbers, and they look very good for Natural North Florida/Big Bend waters. In fact, numbers for Taylor/Dixie counties (Steinhatchee and Keaton Beach) and Wakulla/Franklin counties (St. Marks and Panacea) are significantly better than last year.